This week’s Sepia Saturday theme is about work, ideally it would include an image of a woman working but that seems to be so uneventful and ordinary that no one photographs it. Instead I’m including three photos which came to me as part of my aunt’s photographic archive. Army cook, Pat Farraher, baking. 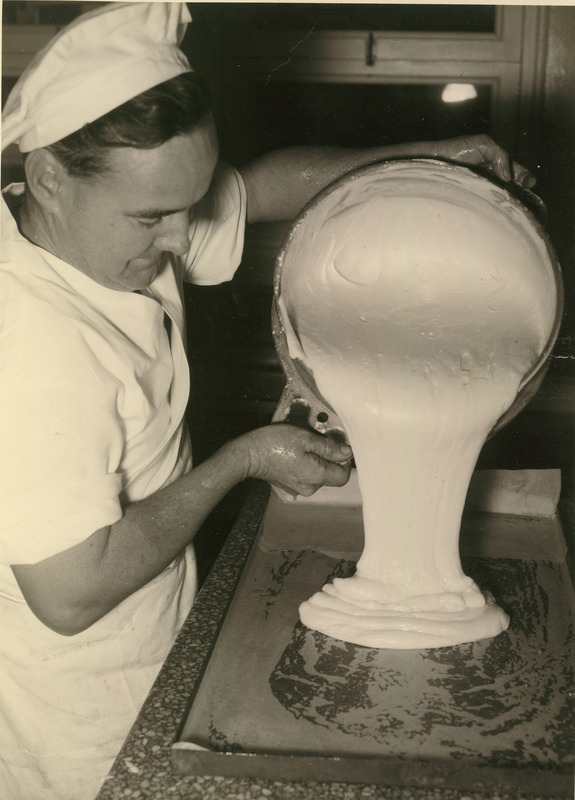 The photos all feature Army bakers probably around the time of World War II. My uncle, Pat Farraher, is the main person in each. One is very serious and I’d love to know who the Visiting Dignitary was. My uncle, Pat Farraher, on the left meets an unknown Vis Dig. Another is the complete antithesis –a frivolous one. Would you want these men making your bread and pastries? Unfortunately I don’t have the background story behind any of the photos. Uncle Pat and a mate “act the goat”. Inventive Sepians might conclude there’s another link, because after all in the real world, cakes are often carried in boxes just like the women were packing in this week’s theme photo. Not to mention that it would be as never-ending a task to feed many hungry soldiers as to fold all those boxes! 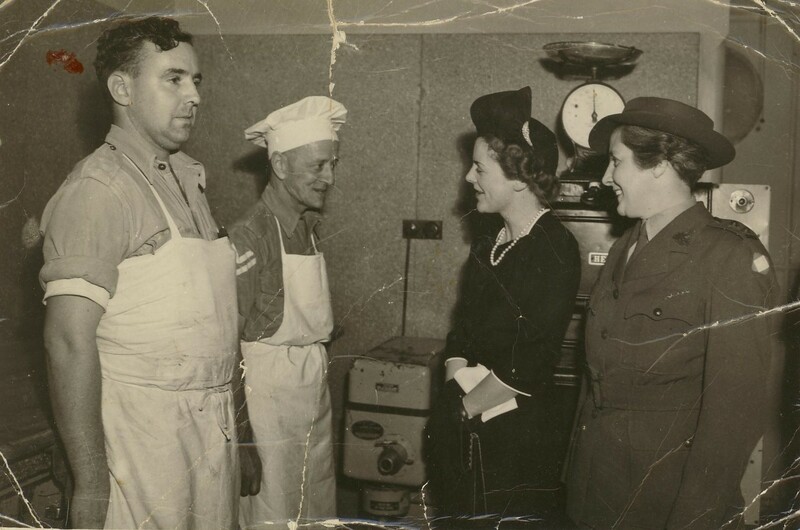 This entry was posted in McSherry Family, Military history, Sepia Saturday and tagged Army cooks, Pat Farraher by cassmob. Bookmark the permalink. Goodness, Uncle Pat looks very nervous. Perhaps he knows he just made a dud batch os scones and their next stop is the tasting room. Smoking bakers are not for me; even in my national Service days they would have been wearing hats – not that improved what was served up. Which Army was Pat in? Australian, Bob, hence the general cheekiness I suspect. I imagine these days a cigarette gets nowhere near a bakery. These would have been during WWII or soon after I think. Three very different photographs in terms of their “formality” but the personality of Uncle pat shines through them all. Yes he was a bit of a character Alan. I’m glad you introduced us to Pat, he looks quite a character. I’ve been peering at the visitors trying to see If I could recognise the lady but alas no. Thanks Little Nell..in retrospect I guess he was the uncle I knew best. These are such great photos. I love the look of the batter being poured onto the wax paper lined pan. And the other two are priceless. Yes the funny ones were good weren’t they. I suspect perhaps the batter one might have tied to the Vis Dig but I could be wrong. Will have to do some research. What a fun series. Let’s hear more about Uncle Pat in future blogs please. 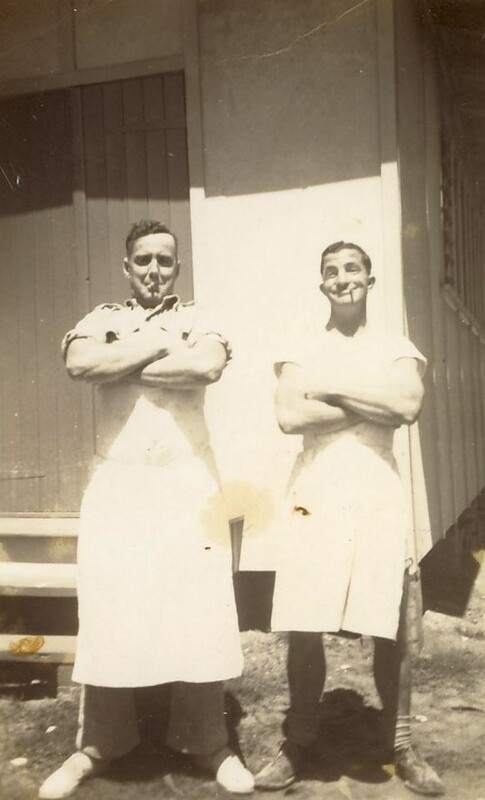 I enjoyed this post very much Pauleen, it reminded me of my mum’s Uncle Andy (Andrew Patrick Murray) who was a baker in the AIF during the 2nd World War… He was, in fact, a baker by trade and worked with his brother in Paar’s Bakery, Pinaroo, South Australia. Thanks Catherine…glad you enjoyed it so much. There were a couple of them acting the giddy goat. Oh Pauleen – these photos are just precious. Lucky lucky you. Such good quality and so full of stories….I am desperate to know who the visiting dig was. Thanks Alex. Unfortunately there’s no longer anyone to ask for a name with certainty. How sleuthy Alex…You may be right…or perhaps a lesser luminary. They certainly look suitably determined to impress. The first photograph was quite a puzzle as I thought it was some kind of sculpture – a head being modelled perhaps. How wrong I was! An erntertaining set of photographs. You’re related to Farraher’s? Isn’t that an Irish name? I only ask because I actually am one and this intrigued me!